(CBS) - Do you ever dream of what it would be like to perform in front of a crowd of thousands of people at an electronic music festival? Thanks to a recent performance and taping of FatBoy Slim at the Electro Venice Festival back in June, you can see exactly what that might be like through the eyes of the performer. 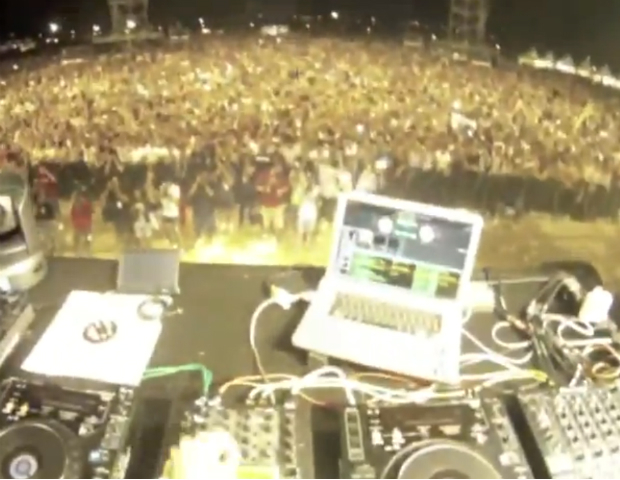 Armed with a camera strapped to his head, FatBoy Slim (Norm) taped the opening of his live set. We can follow his every move as he performs, shifting around on the mixer, scratching and looping, and even the slight panic for a brief moment when his command cuts out during the build up to the first drop. I even found myself with my hand in the air trying to pump up the crowd as the video really makes you feel like you're right there in his place (yeah, I really got into it). I found myself thankful that this was a DJ set and not him singing live because as you can hear, Norm does not sound like he is the best singer. He is, however, one truly spectacular DJ!